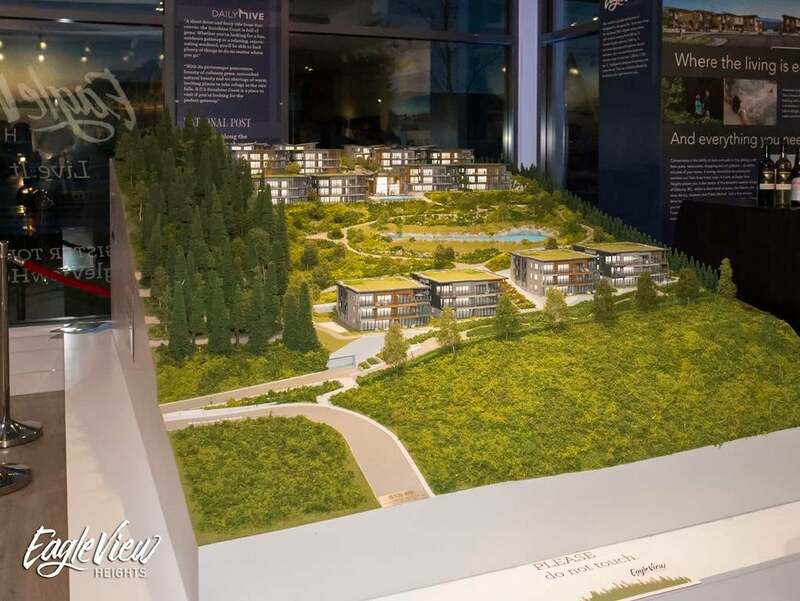 Welcome to the Eagle View Heights presentation centre in Gibsons, BC! Let's take a quick walkthrough so you know what to expect when you pop by for a visit! Past the reception area and on our left is a scale model of the site. The model shows the entire five acre site as it'll appear once construction is complete. The development will consists of 87 units and will feature a mixture of townhomes, condos, and garden suites. Two acres have been set aside for green space and residents will also have access to a very nice amenity building which will feature a hot tub and a pool. The rest of the presentation centre is home to a replica of the open concept living space in one of the future units. The width of the display suite is 29 feet which is exactly the same size as what the finished condo will be. We also see the same ceiling height and finishes that will be present in the final product. 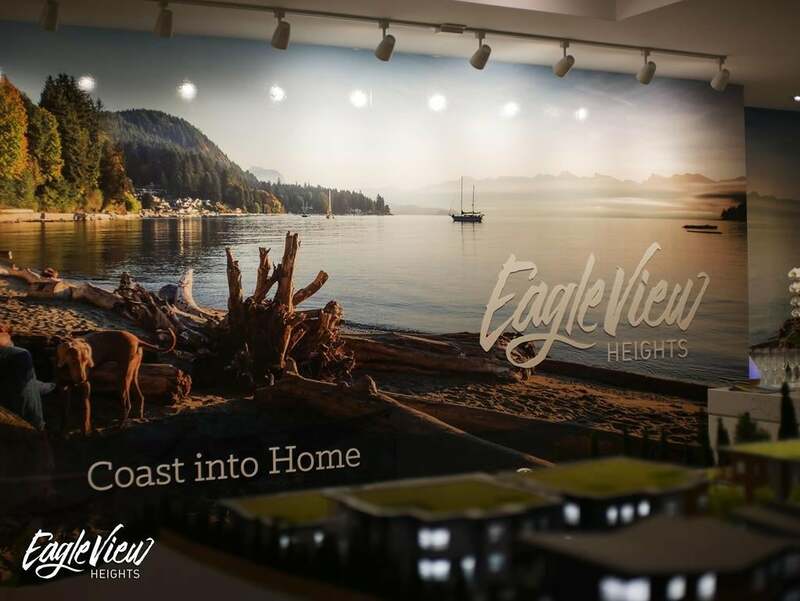 At the Eagle View Heights presentation centre, we've even installed a view wall that will give you an excellent approximation of the view you can expect once you move in. That's a short tour of the our space and you're invited to visit in person and touch and experience the suite first hand. The Eagle View Heights presentation centre is now open six days a week, Wednesday through Monday (closed on Tuesdays). Stop by between 10am and 6pm and one of Eagle View Heights' friendly associates will be happy to walk you through the presentation centre and answer any questions that you might have. Of course, you're always welcome to call me directly. 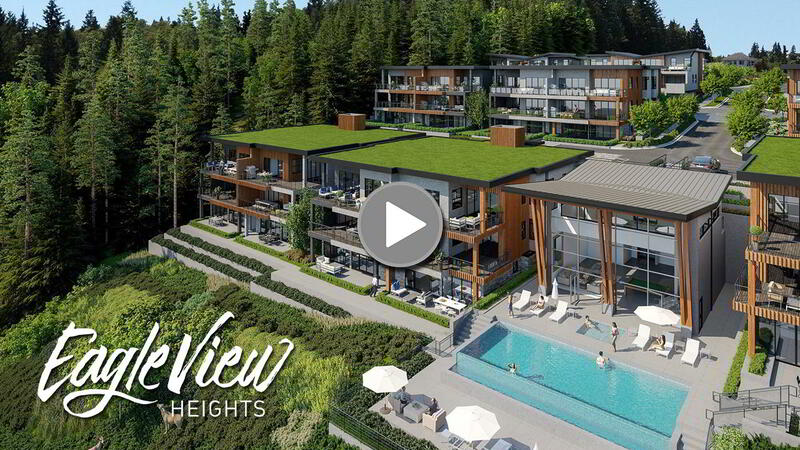 I'm happy to answer any questions regarding Eagle View Heights or Gibsons real estate in general.